palin pals around with democratic donkeys. | six words to change the world. ← being a baller never gets old. palin pals around with democratic donkeys. And by pals around, I mean wears them around her neck. I can’t help but wonder if this was part of the $150,000 the RNC (AKA those who donated to the RNC–don’t you feel hoodwinked?) paid for. The main point of this post was to point out how clueless Palin is. I mean, the woman is legit wearing a scarf that screams vote Democratic. (Where can I get me one of those?!) Buuuut since I have your attention, let’s talk about that $150,000. So much for being a small town hockey mom, eh? That’s probably twice as much, if not more, than Joe the fake plumber makes in a year. That’s more than a college education. That’s health care for a small business. That’s a ton of money to spend on clothes. So I think the argument of Republicans being fiscally conservative is now thrown out the window. Because, oh girl, some of those clothes…I could have gotten at Forever21 for twenty bucks. And if I wanted to go “upscale”, I could still find them at Macy’s. On sale. Those clothes are pretty basic. So we all know what the Republicans and Sarah Palin choose to do with their money. They are not bargain shoppers. I mean, look at the national debt. What would you do with $150,000? Where do your priorities lie? How dare she talk about relating to Americans struggling to pay their bills and get their kids through school. How dare she? Oh doggone it, you betcha that Joe Six Pack doesn’t go on shopping sprees with the RNC’s plastic. UPDATED: From Politico, here is Johnny’s defense of the $150,000. “She needed clothes at the time,” McCain told a group of Florida reporters. 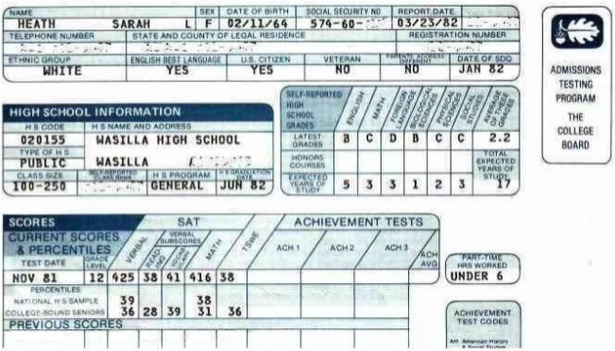 And now, to add on to tragedy that is Sarah Palin, let me just attach a supposed copy of her report card and SAT scores, compliments of one of our DC correspondents. OUCH. Baby girl didn’t even break a thousand. Sorry for ranting a bit. I’m all fired up. No. The scarf was given to her at the Reno, Nevada rally. Someone thought it would be a hoot to give it to her and grab a photo. I’m sure she didn’t stop signing autographs and talking with the public to evaluate a seemingly heart felt “gift”. Clearly either put on by herself in haste or allowed to be placed around her neck by someone during the meet and greet. Your point ihas been destroyed. “Buuuut since I have your attention, let’s talk about that $150,000. The clothes are not hers. It is provided to her on loan. After the campaign, they will be given away to charity. Considering if she wins the election, those clothes could be put up for auction, and raise alot more than 150 thousand for charity. Joe is not a fake plumber. You wish. Spending that much money on clothes, then turning around and giving them to charity who will in turn get more than 150 thousand than the clothes are worth, a profit, is a fiscally conservative thing to do. Meanwhile, Michelle Obama dines on lobster, caviar, and champagne all on the dime of the campaign funds provided by a catholic charity donor. So, while Michelle is costing charity by living it up on their money. Sarah Palin, and the RNC, will be contributing to charity. I’m pretty sure my point remains that she is clueless. She put the scarf on. I know we disagree on the issues, but thanks for reading the blog! We love increasing our readership! But as Kathleen said, thanks for reading! I’m aware of that. But he doesnt need a license to work as a plumber as long as he isnt self employed, plus as long as he works on residential jobs and not commercial. He works as a plumber, he gets paid to do plumbing jobs. So it remains, he IS a plumber. Too true. But the point is that she isnt benefitting from that. Win or lose the election, those clothes are not belonging to her afterwards. 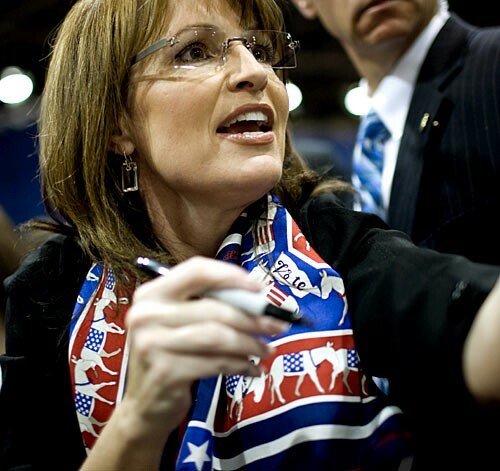 To the person who said that Palin put on the scarf “in haste”…if I were running for office, and someone handed me an article of clothing, you had better be damned sure I’d look at that article of clothing to see what was on it. That scarf could have said “I KILL OLD PEOPLE” for all she knew. So, no, this scarf incident does not prove that she is a closet Democrat, but it does show her hastiness and incompetence. When you’re the VP candidate in, well, what *was* a tight race, you don’t wear the logo of your opponent’s political party, whether it was given to you as a gift or not. To do so proves you’re an absolute idiot. $150k is a sickening amount of money to spend on clothing, whether they’re “loaned” or not, and whether they end up donated or not. Want to be charitable with $150k? *Donate* it. The actual money — don’t buy a bunch of overpriced garments from impressive fashion designers, wear the stuff once, then let it trickle down to the little people. “Joe the Plumber” is, in fact, no such thing. He hasn’t got a license. He hasn’t taken an apprenticeship. He isn’t a member of the appropriate union. His business likely wouldn’t actually be taxed by Obama’s plan (as claimed by the GOP). His name’s not actually Joe, and he owes back taxes. I’m loathe to automatically refer you to a Wikipedia entry, but for once it’s well-researched and backed up with many (54) citations: http://en.wikipedia.org/wiki/Joe_the_plumber for details. Pick a new issue to argue about. They’ve already stuck a fork in this one. The donkey wouldn’t be Eeyore, would it? No Eeyores as a symbol? What she has been saying for the last few days? Eh? Maybe no Democrat ever used the memory of an elephant as a symbol of metaphor? No, I am sure, never. And if Palin had these higher end duds in her closet already, instead of stuff only appropriate for Alaska, wouldn’t THAT be seen as PROOF that she was not a “typical hockey mom?” No, never, I am sure. And if the business Joe the Plumber wants to buy does not YET make the bucks that Obeyme wants to swipe through confiscatory taxes, does that mean he should have no ambitions that it will some day? Of course, if working harder just means Obeyme is going to take it from him – so he cannot hire more people, buy equipment, expand the business and all that “rich” guy stuff – then maybe he just won’t bother. Eh? No, I am sure, never. If the clothes make the man, (or in this case woman), then what does the turban NoMama wore in Africa make him? LOL, one more week until the national gut check, when all of those guilt suffering, scared to say otherwise or my neighbors won’t like me anymore types get behind the curtain and do what’s right. Lock n load..gonna be hell to pay when all of the racist biggots don’t elect the black guy. Lovin’ it. I’m frightened how close Ms. Palin got to being our Commander and Chief. McCain is not an American hero when he allowed this woman who did not know Africa was a continent stay on the ticket. She did not know what NAFTA was. She could not put a “g” on the end of a word like reading. And she was a complete fraud regarding the bridge, her wardrobe expenses, and her own history with the Alaskan sepratist party. John McCain did not protect us. Sadly McCain cared more about winning than our country or future. Pingback: john oliver needs his own show. « six words to change the world.